A reclusive artist haunted by dreams of Sleeping Beauty inherits a family curse with ties to a mysterious mansion. Reclusive artist Thomas Kaiser wakes with sleep paralysis from a recurring nightmare in which visions of an old house prevent him from kissing Sleeping Beauty. After his previously unknown uncle Clive Kaiser commits suicide, Thomas inherits the Kaiser Gardens estate, which includes the mysterious mansion from his dreams. A letter left by Clive refers to a curse on the family’s male bloodline and warns Thomas to never enter the hidden rooms below the basement. Thomas investigates the old mansion and meets Linda Coleman, a real estate agent who has a hidden interest in the house. Thomas dreams once again and finally wakes Sleeping Beauty with a kiss. Sleeping Beauty tells Thomas that her given name is Briar Rose. She also tells Thomas that he must find her in the physical world and wake her with a real kiss. Thomas wakes suddenly in a state of sleep paralysis as a demon sits on his chest. He then wakes from that dream within a dream. An appraiser named Billings tells Thomas about the house’s haunted history. He mentions that the basement does not appear on the blueprints. Thomas searches the basement and finds an ornate case with a button he believes hides a false panel, but he is unable to access it. Thomas researches property records at the county clerk’s office and finds notes left behind in Linda’s handwriting. Thomas experiences an intense vision and collapses to the ground. Thomas confronts Linda and learns that she has been researching Kaiser Gardens since her brother Luke went missing in the house. Linda reveals more about the house’s history, including the fact that 53 people have gone missing there over 125 years. Thomas suddenly collapses again. Thomas has another dream of Briar Rose. Rose warns him of the Veiled Demon and claims that as part of the Kaiser bloodline, Thomas must defeat the demon to lift the curse confining her so that they can be together. Thomas also learns that he is cosmically bound to the property, and cannot be away from Kaiser Gardens for long without experiencing life-threatening pain. Thomas wakes back at Kaiser Gardens with Linda. Linda reveals more about her brother Luke vanishing as well as how Kaiser family men live there as shut-ins before dying mysteriously. Thomas and Linda figure out how to activate the button in the basement with Thomas’ blood. The hidden panel opens and they discover a secret room filled with papers and artifacts. Thomas and Linda retrieve a hand-illustrated journal in an ancient language before being beset by animated mannequin creatures and fleeing the house. Richard Myers, an expert on demonic phenomenon who had been working with Linda, rescues them both. The three of them regroup at Linda’s apartment where Richard recounts legends involving djinn. From what they can understand of the journal, Thomas deduces that his curse is actually tied to Briar Rose, not the house. Richard tells Thomas that the Veiled Demon must be the haunting’s source. Everyone then goes to see Daniel Ishigawa, who Linda briefly dated, to translate the journal. Billings returns to Kaiser Gardens looking for Thomas and is attacked by a mannequin monster. As a romance begins between Thomas and Linda, Thomas tells her how he became reclusive after his fiancée’s unexpected death. Linda is disheartened to hear details about Thomas’ connection to Briar Rose. A partial translation reveals that William Kaiser wrote the journal during the Crusades. His writings mention sacrificing a virgin bride to the devil Iblis and reveal that Briar Rose was cursed with eternal slumber by a djinn. The Veiled Demon acts as Briar Rose’s guardian. Thomas collapses again. Richard and Linda bring him back to Kaiser Gardens. Thomas finds Billings dead. Thomas, Linda, and Richard explore the secret room in the basement and enter a passageway leading to more hidden chambers. They find a mannequin workshop and when creatures attack, they realize that souls lost in the house are turned into mannequin monsters. Linda is forced to destroy the attacking mannequin of her brother Luke. In the final chamber, the trio finds the Veiled Demon spinning a loom. Richard and Linda confront the demon as a distraction while Thomas sneaks into the next room to wake Briar Rose. Thomas kisses Rose, but nothing happens. Thinking back to the bloodline reference from his uncle’s letter, Thomas bites Rose’s lower lip and she finally wakes. Rose reveals herself to be a demon in flesh form when she uses her powers to throw Thomas against the wall. Rose destroys the Veiled Demon by ripping out its heart. After attacking Linda, Rose and Thomas vanish in swirls of smoke and rematerialize in another realm with Thomas as a captive spirit. Elsewhere, Daniel finishes translating the journal. He learns that the truth of the Kaiser bloodline is that they are cursed with demons living inside them. Rose was the evil entity all along, exploiting the Kaisers’ bodies as vessels in order to bring about the apocalypse. An entrancing beauty cursed with eternal slumber haunts the dreams of reclusive artist Thomas Kaiser. Whenever he attempts to wake the woman with a kiss, searing images of an ominous mansion paralyze Thomas with pain and immediately jolt him back to reality. His only friend thinks Thomas is emotionally troubled. His therapist thinks the visions stem from a deeper trauma. Yet Thomas’ life is due for another unusual turn when an odd uncle he never met takes his own life after naming his nephew as heir. Thomas receives two things from previously unknown uncle Clive. To Thomas’ astonishment, the first passed-down possession is the old house from his dreams, which comes complete with a written warning about never entering the basement’s hidden rooms. The second part of the inheritance? A cursed Kaiser bloodline dating back to the Crusades tying male heirs to the mansion, as well as to the sleeping beauty in their dreams. Thomas isn’t the only one confounded by his newfound fortune of frightful family secrets. The brother of estate agent Linda went missing at Kaiser Gardens, as did dozens of others in the last century alone, and she demands answers. Linda and Thomas thus set out to solve an ever-deepening mystery involving mannequin monsters stalking darkened halls, ancient legends of demons versus djinn, and an ever-present attraction to the otherworldly woman compelling Thomas to find her so that she might finally be set free. “The Curse of Sleeping Beauty” puts a modern spin on the Brothers Grimm classic by reimagining a familiar fairy tale as a gothic haunted house mystery. Filmmaker Pearry Teo similarly combined elements of fabled legend and costumed romance for the dramatic horror of 2013’s “Dracula: The Dark Prince” (review here). That same intention to create a sweeping sense of atmosphere through genre-blending fantasy is also on full display here. Citing influences such as Guillermo del Toro’s “Pan’s Labyrinth” and James Wan’s “The Conjuring” (review here), Teo has a focused cinematic eye for creating visually striking movies with period piece flourish. It’s a collaborative achievement, as Jacqueline Goehner’s pointed peacock feather costuming, Scott Glasgow’s moody music, Alessandro Marvelli’s detailed production design, and Christopher C. Pearson’s crisp cinematography work in unison to generate a hypnotically dreamlike feel and sharp look. Having compiled a capably creative team of technical talent, what director Pearry Teo needs next is an energized idea for a lively script. “The Curse of Sleeping Beauty” isn’t it. The pretty picture charm of “The Curse of Sleeping Beauty” suffers from the fatigue of slow-paced predictability. It’s the kind of film that could be clipped to half of its length without skipping a beat, yet pads itself with overwrought exposition spread thin throughout uninteresting scenes occupied by unnecessary characters. Some of the best bits come from lingering looks and comments muttered after someone exits a scene and the camera hangs back for a moment. These quick throwaways tease entertaining personalities for the people populating this world, but the movie has no substantial use for the revolving door of roles relegated to two brief appearances or less. Spooks and scares echo equally standard fare. Flashlight beams wave slowly across creepy mannequins in dark and dusty rooms. Flickering lights feature prominently during creature attacks. Execution is effective enough, though there is nothing unique about the presentation or the purpose that captivatingly commands undivided attention. Make it past the many moments of seated conversation, journal translation, or cellar spelunking and you will arrive at an ending likely to leave the impression that the film is incomplete. In a way, it is. The movie purposely concludes on a note of unresolved ambiguity. That’s because “The Curse of Sleeping Beauty” was envisioned and is intended as a transmedia project encompassing multiple formats, of which the feature film is only one part. 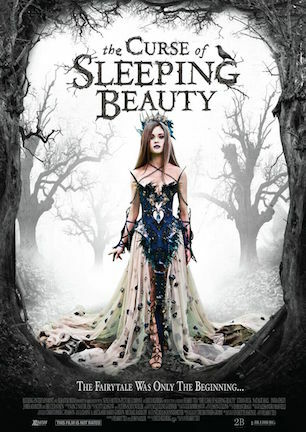 In addition to paralleling a comic book from artist Everette Hartsoe, “The Curse of Sleeping Beauty” serves a secondary function as a two-part episode for a proposed television series. This bit of knowledge solves the mystery of why tangentially-related characters and concepts are established only to disappear as fast as they are introduced. It also explains why the film feels unfinished, and ultimately unsatisfying. Small screen motives don’t translate into big screen scope. Although aesthetically appealing as a film, “The Curse of Sleeping Beauty” undercuts itself as a feature by trying to pull double duty as a TV pilot. Additionally undone by the dead weight of an overstretched story, stereotypical setups, and a twist telegraphed before the opening titles conclude, “The Curse of Sleeping Beauty” doesn’t fully develop the distinguishing characteristics it wants, and needs, to truly pop as a distinctively visionary property. May 19, 2016 by Ian Sedensky.